I’ve been sitting on this freaking computer nearly all day, dealing with stupid little keyboard characters and symbols to validate my website. What exactly does ‘validate my website’, I know you’re asking. Take a look at Website Validator if you don’t have much to do with your time. If you’re interested in spending days on your own website, for little gain, this is for you. I went through all of the main pages on my Expeditions Alaska website trying to fix stupid little “errors” that apparently needed fixing. Now, my website worked just fine before I did all this. I checked it on various browsers, on various computers and Operating Systems, and it worked just fine. However, the powers that be over at validator.w3 gave me a big thumbs down. My home page, which I still can’t seem to validate correctly, had nearly 40 errors on it. Sounds like a lot, eh? Well, no, it’s not really. Some of my other pages had over 70 errors on them. I think tomorrow I’ll spend some time trying to get this website validated and correct a few of the things that w3 seem to get so upset about. Why do all this? I’m told it can affect your google ranking. Google is the lifeblood of a website, so I figure I better make an effort. Ya wanna know what’s REALLY funny about that? Go to the validator again and type “http://www.google.com” in the validate by URL box. Then click ‘check’. Oh yeah, the photo. My friends Matthias Melcher and Gabby Campbell, whitewater kayakers extraordinaire, had sat their boats down here while they went to get changed or something (I can’t remember what). I took this shot, using a little fill flash for the shadows under the boats. 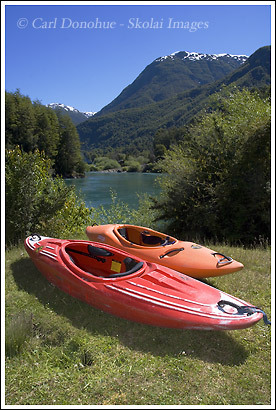 Look at that river – ain’t the Futaleufu just beautiful??? More whitewater kayaking photos. This entry was posted in Miscellaneous, Web Stuff on April 25, 2007 by Carl D.
How add your site to digg?